One of the jobs I have at Molly's school is Social, Celebration & Event Coordinator. 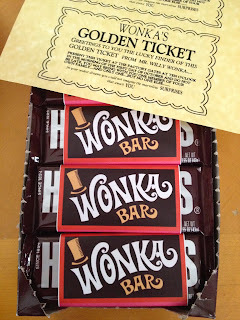 Teacher Katie recently finished reading Charlie and the Chocolate Factory to the class and they LOVED it. I got permission from the office staff to set up a movie night at the school. One of the Wonka Bars had a Golden Ticket inside. That lucky kid won a copy of the movie (the 1971 Gene Wilder version). Of course as soon as I opened the box to hand them out one of the older brothers chimed in with, "Hey! Those are Hershey bars." Cut me some slack kid! I picked up pizza from a local family run place (Legend's Pizza) per recommendation from one of the moms. They were great and gave me a discount. Plus they filled out some frequent diner cards and I have a free pizza coming my way. I told the kids to come in their PJs so they would be all ready for bed when they got home. Next time I would suggest pillows along with the blankets they brought. Plus, camping chairs for the parents as the office chairs got a little stiff about halfway through. Everyone had a great time and several kids wanted to know why they couldn't spend the night. Where's Molly? Oh, playing with the younger sister of a class mate of course!